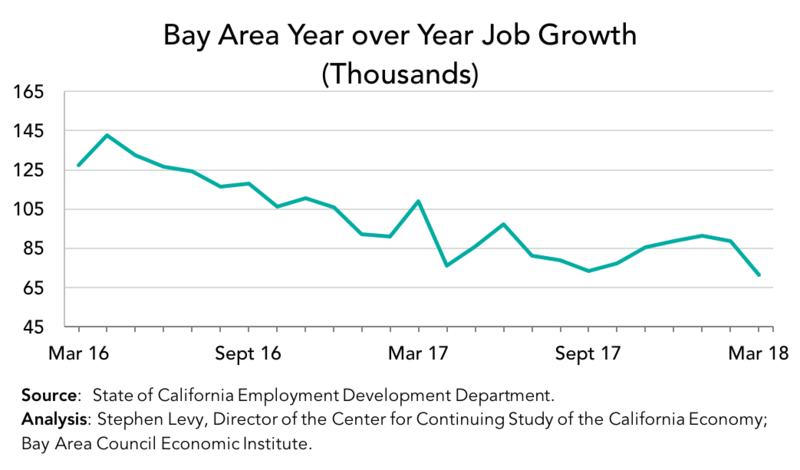 Bay Area job growth slowed in the first three months of 2018 much as it did in the summer of 2017. 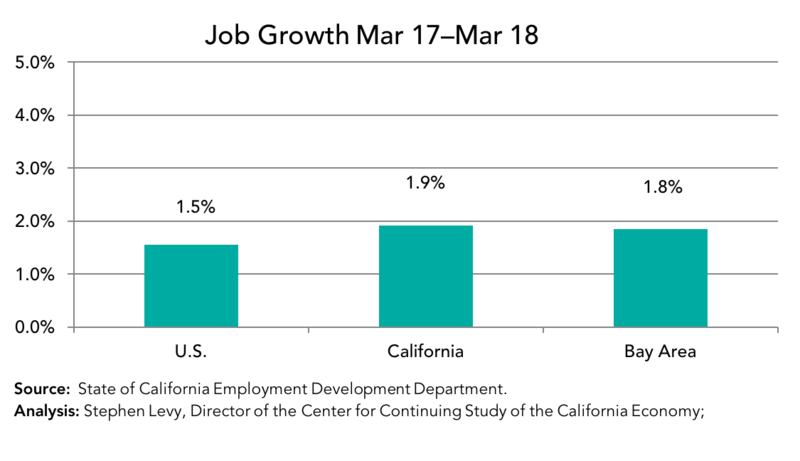 By March 2018 year over year job growth slowed to 71,900 (1.8%), the slowest growth during the past two years. The number of deals for additional office space continued strong even as current job growth paused. 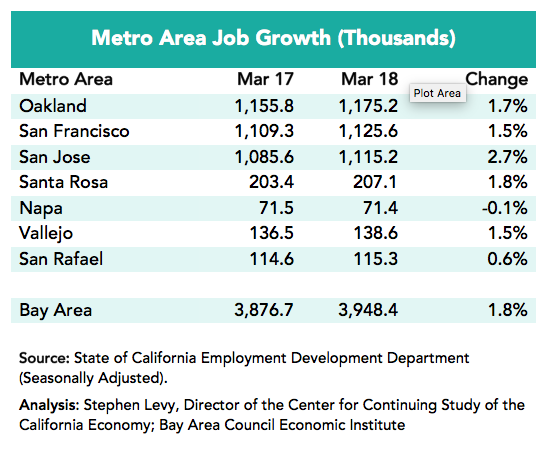 The Bay Area posted a 1.8% job growth rate during the past 12 months just below the state average and still above the 1.5% U.S. gain. 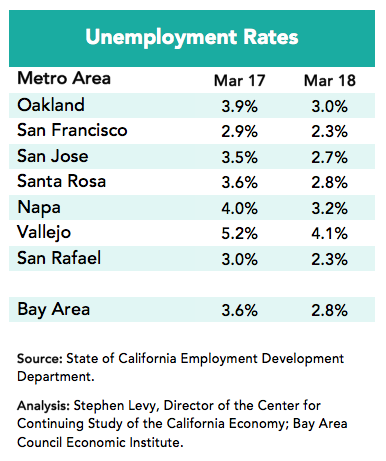 March 2018 continued the strong decline in Bay Area unemployment rates. The region wide unemployment rate fell to 2.8% compared to 4.3% in the state and 4.1% in the nation. The number of unemployed residents fell by 34,100 between March 2017 and 2018. These low unemployment rates combined with high housing costs pose challenges to firms trying to expand their workforce. Labor force growth slowed to a trickle during the past year though the surveys on which these data are based do not have a large sample size. 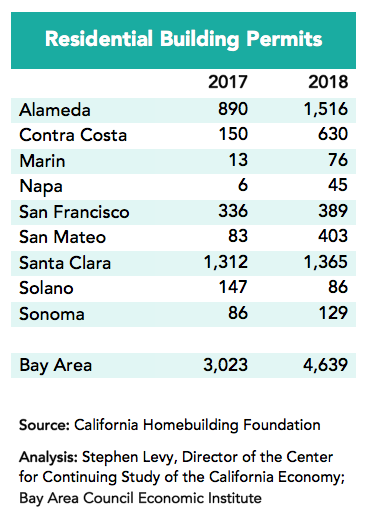 Housing permit levels continued the surge that began in 2017 with permit levels rising 50% in the first two months of 2018.led by strong gains in Alameda and Contra Costa counties. There are many indications that companies and communities are responding to growth challenges and planning for the future. Every week there is news of a new housing project in Oakland, San Francisco and San Jose. Plans for substantial housing in downtown San Jose are moving ahead along with plans for housing near Facebook and approvals are surging around the region. Still even the near 30,000 permits issued this year fall short of the 35,000 to 40,000 needed to keep pace with population growth while relieving some of the doubling up that has occurred over the past decade in response to low construction and rising rents. And not all permits eventually get built. And residents have passed and will get a chance in June 2018 to approve more major transportation funding measures. 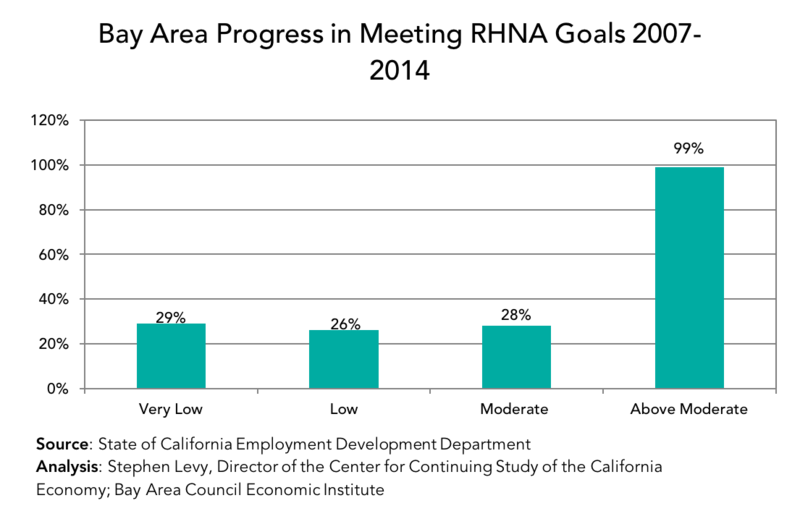 But the overall housing shortage is not evenly distributes among price and rent categories. Very low income households are those making between 0% and 50% if area median income (AMI). Low income ranges from 50% to 80% of AMI and moderate (middle income) ranges from 80% to 120% of AMI. With funding and approval challenges, it is not surprising that the low and very low income targets are not being met. But the shortage for middle income households is virtually the same as that for low and very low income households. So there is lots of work to be done at most income levels to make housing more affordable in the region.